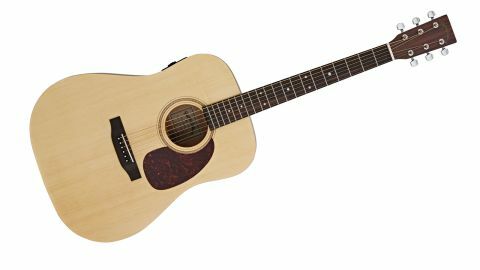 At this price, we were surprised by the DME's performance, and if you're new to acoustics, this is an inviting guitar for the home and open-mic stage. Bright, ringing character. Very playable satin-finished neck. Nice preamp. As acoustic players, we've never had it so good. Take the Sigma brand. The company's had a very interesting time since it returned three years ago, re-establishing the former Martin brand's reputation with an impressive value-packed range since its purchase by German firm AMI. Though the Martin link has ended, the iconic company's influence on the range is tangible. Sigma's SDM and DR dreadnoughts offer a budget alternative to Martin's D15M and D28, but this DME fits in at the entry level even by Sigma's standards. For tonewoods, we have laminated mahogany back and sides with a solid Sitka spruce top and a solid mahogany neck. "There's a bright, ringing character to this dread, and it has punchy mids and pronounced treble to spare"
The DME's build is lightweight, and that could prove inviting for younger or beginner players. It has an effect on tone, though, as we'll cover later. While it's no plain Jane, Sigma's design ethos seems consciously stripped back here, in line with modern tastes that are moving away from flashy abalone binding and towards understated charm. We appreciate the satin finish on the mahogany, especially the neck. The gloss vs satin neck debate is a personal one, but here it gives the DME a Martin vibe that invites repeated plays. Something else that brings us back is the action: it's one of the lowest we've experienced on a review acoustic here. But there's no buzz to be found across the 'board, and the setup is sound and comfortable around the 12th fret. While it limits your bends - and we'd be wary of tuning down too low - the action will be inviting to young hands, and could ease the transition for electric players. It's surprising to see a bone saddle and nut at this price, despite being a Sigma added-value calling card. There's a bright, ringing character to this dread, and it has punchy mids and pronounced treble to spare. It's lacking some of the resonant low-end we'd like from an acoustic of this size, but the DME's voice has its advantages - and these become even more apparent when we plug in. Sigma's own under-saddle and preamp compares well with the Fishman Sonitone under-saddle transducer and Presys+ preamp on our more expensive Sigma SDM-15 dreadnought for output. Cranking the low EQ draws out more bottom-end, without losing the almost parlour-esque midrange punch, which holds its own in the mix with a band. Solo, it's more useful for fingerpicking than strumming, but we're pleased to report Sigma's own-brand system avoids much of the undesirable plastic-y piezo 'ping' that plagues some electros when running direct through a PA.
At this price, we were surprised by the DME's performance, and if you're new to acoustics, this is an inviting guitar for the home and open-mic stage. It seems the Sigma success story is set to continue.